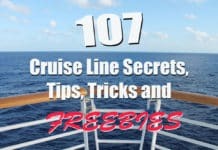 If you’re a first-time cruiser, then all the new terms can be overwhelming. What the heck is a nautical mile? And why is everyone on the Internet using strange acronyms like FTTF, MDR, and OBC? Well don’t worry. Even if you don’t know your bow from your stern, we have you covered. We’ve rounded up 51 of the most common cruising terms you’ll come across. Have more terms you want to know? Let us know in the comments section. Aft – The back of the ship or towards the stern. B2B (Back to Back) – Two cruises taken one after another. This can turn two shorter cruises into a longer trip. Bearing – The direction the ship is traveling, usually noted as degrees. For instance, a bearing of 180 degrees means you are headed due south. Bow – Front of the ship. Cabin – A typical guest room on the ship. CCL – Carnival Cruise Line. Closed Loop – A cruise that starts and ends in the same port. Crown & Anchor Society – Royal Caribbean’s loyalty program that offers benefits to repeat cruisers. Customs – The people at the homeport who check travelers for goods being brought in from another country. DCL – Disney Cruise Line. Debarkation – The process of getting off the cruise ship. Declaration Form – A form filled out by a traveler stating what they are bringing into a country. Deposit – A small amount of your cruise fare paid to reserve your cabin. Dry Dock – A special dock that allows for draining of water so the ship is completely dry underneath. Used during refurbishment to clean and repair the underside of the ship. Duty – A tax imposed on goods bought abroad and brought home. Embarkation – The process of getting on the cruise ship. Excursion – A tour taken while in a port of call on a cruise. Excursions cost extra and aren’t included in your cruise fare. Faster to the Fun (FTTF) – An add-on service offered by Carnival that allows passengers to receive special perks like bypassing boarding lines. Read more about FTTF here. Friends of Bill W. – Code for Alcoholics Anonymous meetings on a cruise ship. Friends of Dorothy – Code for meetings of LGBT passengers on a cruise ship. Forward – The front of the ship or towards the bow. Fun Shops – Carnival’s online shops that sell everything from bottled water to bathrobes. Items purchased here ahead of time can be waiting in your cabin when you board. Galley – The kitchen on a cruise ship. Gangway – A platform that goes from the ship to the pier. Gratuity – Tips aboard a cruise ship. They are often automatically applied to your account. Head – The bathroom on a ship. Homeport – The port where the cruise ship returns after every cruise, letting passengers off and welcoming new passengers. Knot – Equal to one nautical mile per hour, or roughly 1.15 miles per hour. Leeward – The side of a ship or island that faces opposite of the dominant wind direction. Lido Deck – An open-air deck on a cruise ship that usually has pools, lounge chairs, and more. MDR – Main Dining Room. Where most evening meals are eaten by passengers. Midship – The middle of the ship. Muster Drill – A safety drill done on your first day on the ship where you head to your emergency meeting location. OBC – Onboard credit. Typically an amount of money a cruise line will place in your account to use like cash while on the ship. Purser – The person responsible for handling money on a ship. Normally you will just visit Guest Services if you have an issue with your account. Port – The left side of the ship if facing forward (also, where the ship docks). RCCL – Royal Caribbean Cruise Line. Refurbishment – A normally two or three week process where a cruise ship is taken out of service to remodel and add new features. Repositioning Cruise – A cruise that moves the ship from one homeport to another. For instance, many ships reposition from North America to Europe in the spring. Sail & Sign (SS) – The passenger’s onboard account on a Carnival ship. Your account is access via a card that you use on the ship instead of cash. Sea Day – A day of travel between ports where there is no stop in a port. SeaPass Card – Your room key and card for accessing your onboard account on a Carnival cruise. It’s used just like a credit card to charge items to your room account. Specialty Restaurants – Higher-end restaurants on a ship that charge an extra fee for dining and aren’t included in your cruise fare. Starboard – The right side of the ship if facing forward. Stern – Back of the ship. Suite – A larger, more expansive guest room on a cruise ship. Tendering – The process of using a smaller boat to reach ports that can’t be access by a larger cruise ship. Tender ports include places like Belize City. Themed Cruise – A special cruise focused on a lifestyle or activity; for example a nudist cruise. Typically a company rents the cruise ship and then resells cabins so only interested passengers are sailing. Transfer – Typically, transportation from an airport to the cruise port. Windward – The side of a ship or island that faces into the dominant wind direction. VIFP Club – Very Important Fun Person Club. Carnival Cruise Lines’ loyalty program that offers benefits to repeat cruisers. Have more words you want defined? Let us know in the comments below!